This barograph (8 different models selectable) is a standard model with a register drum and a quartz mechanism to measure the absolute air pressure. Due to a writing arm with a felt-tip pen the barograph allows a recording of one graph of the barometric air pressure on paper over the course of a week. The delivery includes a whole year’s supply of those paper rolls. 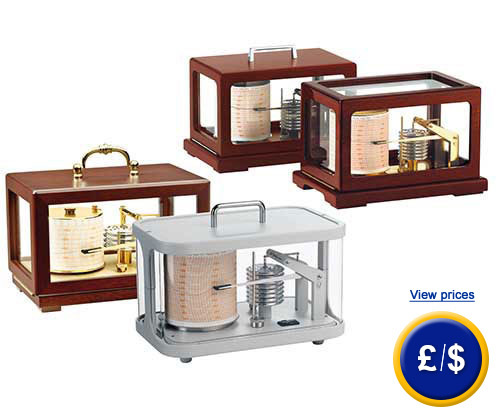 Depending on the model, the barograph will be delivered with a pointer damping, with 4 or 8 can format, gold-plated, in synthetic-appearance or stainless steel design. For further information about the installation of the barograph 2055AL, please read the following technical data or use our Hotline: UK customers +44(0) 23 809 870 30 / US customers +1-410-387-7703. Our engineers and technicians will gladly advise you regarding the installation of the barograph and all other products terms of regulation and control, or scales and balances of PCE Instruments.